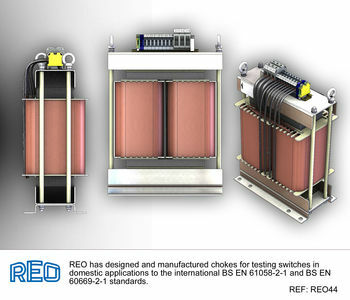 REO has designed and manufactured chokes for testing switches in domestic applications to the international BS EN 61058-2-1 and BS EN 60669-2-1 standards. BS EN 61058-2-1 applies to switches for appliances with particular requirements for cord switches, while BS EN 60669-2-1 covers switches for household and similar fixed electrical installations with particular requirements of electronic switches. The tests for the chokes themselves demanded that nine different rated switches should be tested at the required power factor. Other manufacturers of chokes tend to do this using separate air-cored chokes and several external resistors. However, there are two key problems with this process. The first is that multiple separate chokes must be used in this scheme, which means that the space required and capital outlay is high. The second is that external resistors tend to run at surface temperatures of around 300 degrees centigrade, which means that they must be ventilated and guarded. Air-cored chokes do not saturate but to achieve the levels of inductance required, in this instance to a maximum of 450mH, they would have to be physically very large. Furthermore, air-cored chokes have very high stray fields which can cause health and safety problems. “When a client contacted us to provide some chokes for load testing of appliance switches to BS EN 61058-2-1 and BS EN 60669-2-1 the requirement seemed relatively straightforward,” recollects Steve Hughes, director of REO UK. Power factor is the ratio between real and reactive power flowing in a circuit and is an important consideration when rating switches. Loads like fluorescent tube lighting and transformers for powering low voltage lighting have power factors of much less than the ideal of unity and so the switches used in these applications must be capable of safely switching the current. In test applications it is usual for linear inductance and resistance to be used to derive the required load at the correct power factor.